If you ever run into "Queer Eye" style expert Tan France on the street and he doesn't like what you're wearing, chances are he's not going to tell you. That is, unless you ask what he thinks. During a recent sit-down with AOL Entertainment at Express 51st + Madison ahead of his appearance at the store's Success & Style series, France revealed that he only gives style advice to those who ask for guidance -- unsolicited advice would just be too cruel. "I don't give unsolicited advice," France said. "I don't think it's fair! Unless you're close with someone, I don't want to destroy them. If I think something is heinous, but the person feels amazing in it, who am I to critique it? If they think that those bell-bottom, cropped, shredded jeans look good, then good for them!" "I promise they'll look back in horror," he added with a laugh. "But if it makes you feel good, go for it!" France was the face of Express' Office Style Tips Q&A session last week, which is an elevated position in the public eye that he's still getting used to just three months after Netflix's "Queer Eye" reboot made him and the rest of the Fab Five overnight sensations. "It’s still a strange feeling," he explained to us. "The weirdest thing is people knowing your name. I wasn't in this industry before, and I never wanted to be in show business before this. All of the other boys were part of this world, so for me it was the most shocking. I was a very private person. I never had an open social media account. So, for me to walk down the street and have people say, ‘Hey, Tan!’ I turn around thinking, ‘Do I know you?’ That moment is new for me. It’s difficult." 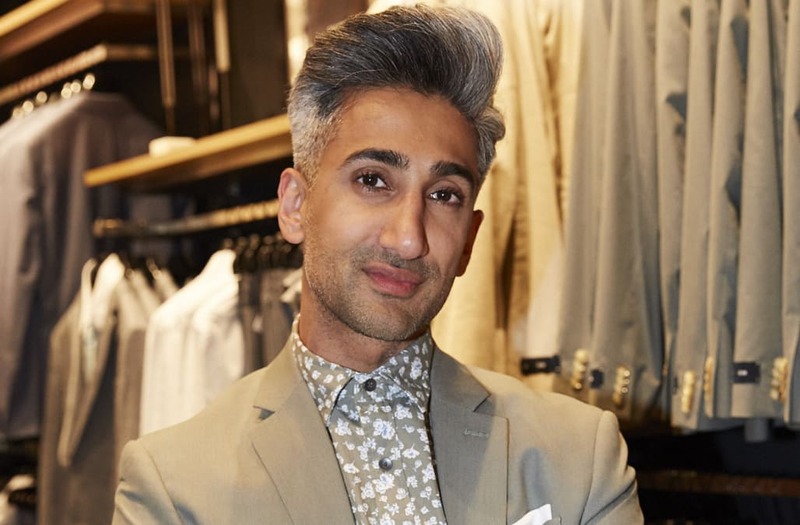 Tan France joined Express for a panel discussion at the "Success and Style" event in New York City on Wednesday, May 2. Even if it's still "difficult" for him, he doesn't show it. As hundreds of fans lined up outside of the Express store in Midtown Manhattan, France was jittery with excitement to greet fans who, he says, make him "feel the love." As for the office style tips that he was doling out to eager ears, France explained that his two-year stint as a receptionist back in London made him more than qualified to share his expertise on what men should be wearing when they go to work every day. "I worked as a receptionist in England for a couple of years whilst I was building up my business," he recalled. "I decided to take a massive pay cut from my full-time job and work as a receptionist, so I could make my own business work. I had to wear a suit. I don’t love to wear a suit in a corporate setting, but I wore one for two years and I did it my way: Cropped, with sneakers, with a shirt of my choice. I definitely have experience with a corporate job, and I still think that, even if you have to wear a suit, you can make it cool and make it your own without looking like you’ve lost your mind at work." France said that, while guys should strive to include some sort of color or pattern in their everyday workwear, they should avoid too much of a pop -- it's easy for an work look to get too busy. "I love that people want to throw on a print in their socks or a pocket square or a tie, but you’re going to look crazy if you’ve got all of those things going on, so choose two," he said. " For men who don't want to have to make a choice every single morning while getting ready for work, France's advice was to simply go back to basics and throw out anything that hasn't been worn in a while. In other words, just make things easier for yourself. "If you have items in your closet that you haven’t worn in a year, then you’re never going to wear them. Pull them out," he advised. "If you are struggling with style, find what we call a capsule collection, which men and women who are style-challenged need to be more aware of. [They're] items that are going to make sense for their day-to-day: A tee, a great pair of jeans that fits well, a great suit that’s dark and goes with anything." "There are so many great options that are basic, and once you’ve gotten those down, you’ll always look great," he added. "Then it’s time to add more quirk and personality to it. If you don’t have your basics down, then you’re never going to make it."